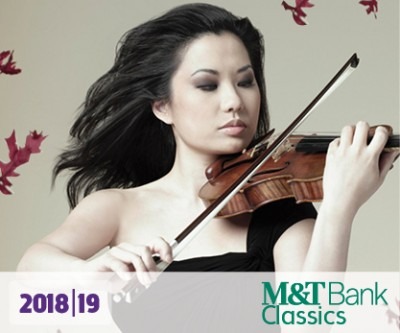 Child prodigy turned violin superstar Sarah Chang returns to the BPO for the first time in a decade to perform Brahms’ Violin Concerto, a piece that received its premiere 140 years ago in 1879, with Brahms himself conducting. The BPO also continues its exploration of the music of French composer Florent Schmitt on this program. Come at an hour early to hear directly from the artists in “Musically Speaking,” sponsored by Uniland Development. In 2006, Ms. Chang was listed in the 20 Top Women in Newsweek Magazine’s “Women and Leadership,” and in 2008, Ms. Chang was named a Young Global Leader for 2008 by the World Economic Forum (WEF). In 2012, Sarah Chang received the Harvard University Leadership Award, and in 2005, Yale University dedicated a chair in Sprague Hall in her name. In 2004, Ms. Chang carried the Olympic Torch in New York for the Olympic games, became the youngest person ever to receive the Hollywood Bowl’s Hall of Fame award, and was awarded Internazionale Accademia Musicale Chigiana Prize in Sienna, Italy. Other previous distinctions include the Avery Fisher Career Grant, Gramophone’s “Young Artist of the Year” award, Germany’s “Echo” Schallplattenpreis, “Newcomer of the Year” honors at the International Classical Music Awards in London, and Korea’s “Nan Pa” award. In 2011, Ms. Chang was named an official Artistic Ambassador by the United States Department of State.